My name is Leslie Falteisek-Sultemeier. I was born and schooled in Minnesota. I received my Master of Fine Arts in ceramics (1971) under the renown potter and teacher Warren MacKenzie at the Univ. of Minnesota. He studied with Bernard Leach in England and Hamada, one of Japan’s National Treasures, and carried on the tradition of pottery that is affordable and made to be used everyday. I am striving to follow in that philosophical footstep. I started making my animal rubber stamps in college as a result of wanting to use multiple duplicate images in my thesis show drawings. The image collection just mushroomed through requests from individuals for drawings of their breeds and favorite animals, topping out around 900 images. The technology that I used for making my rubber stamps is now quiet antiqued which prevents me from adding new images to my “line”, but I can still do custom one-run stamps for customers. After college, I worked in graphic design, rubber stamp manufacturer, and the (then new)vinyl industry for 20+ years. Along the way, I raised and showed Manx cats, in 1985 becoming an Judge for the Cat Fanciers’ Association. I moved from Minnesota to Texas in 1994, delighted to leave the cold & snow behind, and added accounting to my list of vocations. In 2005, I married Kermit Sultemeier and moved to his home-place outside of Johnson City, Texas. 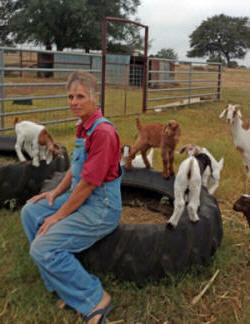 We have Braunvieh-Brangus-Brahma beef cattle and BoerX meat goats. I decided to retire from judging in 2010 and accounting in 2015. This gave me the time to continue on with the stamp business and the opportunity to set up a small pottery studio at our ranch. Going back to pottery was like “coming home”. It has taken over most of my creative outlets and will hopefully continue to do so for many years to come. The ranch in itself is a full-time endeavor, but I am happy to be celebrating over 50 years in the arts!